Wow, Kerry! What a great post. 1. About wanting hand quilting to show up so it’s worth the effort — I agree, but I have difficulty with crossing seam lines when I do hand quilting (which I have only done on one quilt so far, so I’m still a beginner with that too!). I try to stab stitch one stitch at a time across the seams like I read to do in a book but still feel like the stitches look wonky crossing seams. Any ideas? How do you handle crossing seam lines with your Baptist fan quilting pattern? 2. I’m not ready to try the hexies yet, since I’m immersed in applique and paper piecing, but we all know it’s only a matter of time! It looks like you have little hexagon papers stuck to the back of your fabrics before you stitch them. Is that freezer paper that you ironed on? 3. All of your applique is so inspirational, especially the Seasons series. Your fabric choices are so perfect — the squirrel!! The apples!! Love them all! Thanks again for participating. I agree that the biggest secret about applique is how easy it is. I was stitching petal layers off block in the waiting room at the doctor’s office this morning, and a woman came over to see what I was doing — turns out she’s a quilter who never tried applique because it looks too hard. I do hope she gives it a try now! Wonderful post. I think what I appreciate most about your blog is the fact that you take this terribly complicated applique work and break it down into something that looks possible. Keep up the good work! Wow, Kerry! Great post! You and I have so much in common…we share the same healthy addictions, LOL! I just love your work! Best around the world hop post I’ve seen. But then I love your work. 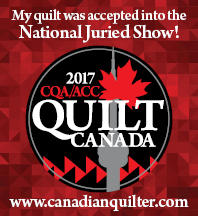 I’ve bookmarked that QuiltMania no. 100 for that same quilt. Thanks for sharing, Kerry.